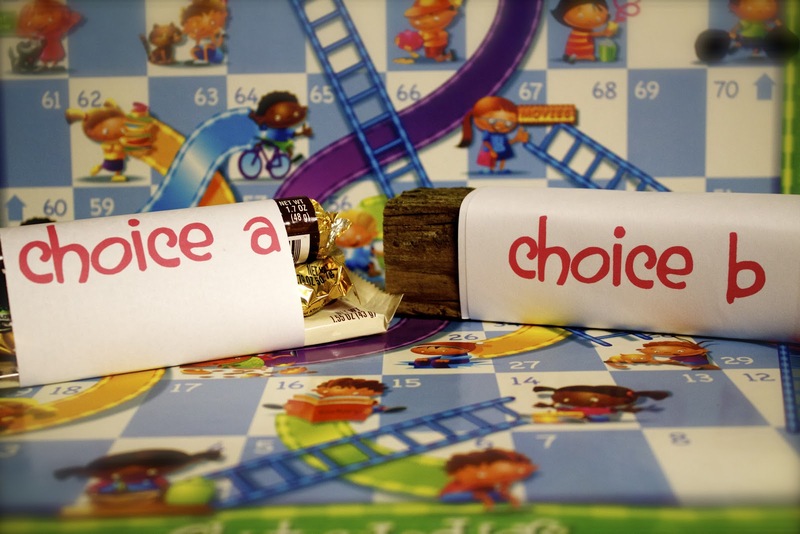 CoZy BuGz: Why Do The Choices I Make Matter? 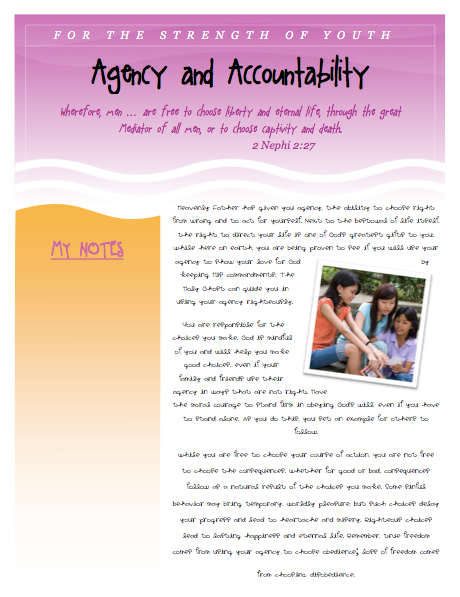 Invite each young woman to silently read “Agency and Accountability” in For the Strength of Youth and share what impresses her. Class members could then choose another standard in the book and share some choices they’ve made in relation to that standard and the blessings that came from their choices. For example, you might discuss as a class the blessings they’ve received for following the counsel to avoid addictions (see page 27). I made these printouts that I thought might make the silent reading a little bit more exciting. Next to the Agency and Accountability section I made a space where they could take individual notes about anything they found that stood out to them. And BONUS: My husband is teaching the YM this SAME lesson on Sunday, so I made a more manly version for the boys! When I've done this object lesson in the past, I start by having a volunteer leave the room. I set out "CHOICE A" (a couple of candy bars) and "CHOICE B" (a big ugly block of wood). 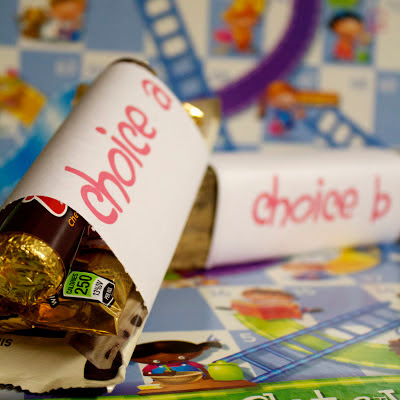 I cover the choices with a dish cloth and tell everyone else in the class they can try and convince the volunteer to make a certain choice when they get back, but be sure not to give away what the choices are underneath the cloth. When the volunteer comes back in they are told they may take home either CHOICE A or CHOICE B. Without the knowledge of what's under the cloth and with everyone in the room shouting out different things, the YW volunteer may get a little confused. I then pull out my cell phone and say how Heavenly Father is always there to help us make wise choices. Before class I went into my phonebook and changed the name under my number to Heavenly Father. In class, I then secretly send a text to myself saying "Choose Choice B." I try and make some sort of joke saying I have some sweet connections with "The Big Guy" and when the YW looks at my phone, she sees a text message from "Heavenly Father" telling her which choice to make. At this point, the YW always decides on CHOICE B. I lift up the cloth and say, "Congratulations, you get to take home an ugly piece of wood!" Everyone in the class is usually confused at this point... Don't worry, keep going! I then laugh and tell the YW, "Just kidding. That doesn't seem really fair. Now that you can see what both choices are, you go ahead and decide which one you want to take home." So far, every time I've done this, the YW decides to grab the candy instead and goes and sits in her seat and starts snacking on her chocolate. I then explain how we need to trust the Lord and even though we don't always understand why we're asked to make certain choices, Heavenly Father can see the big picture and knows which choice in the long run will bring us happiness. When I peel off the piece of paper wrapped around the wood a $10 bill falls out from inside. It's always been a humbling experience for the girls. I LOVE this object lesson! 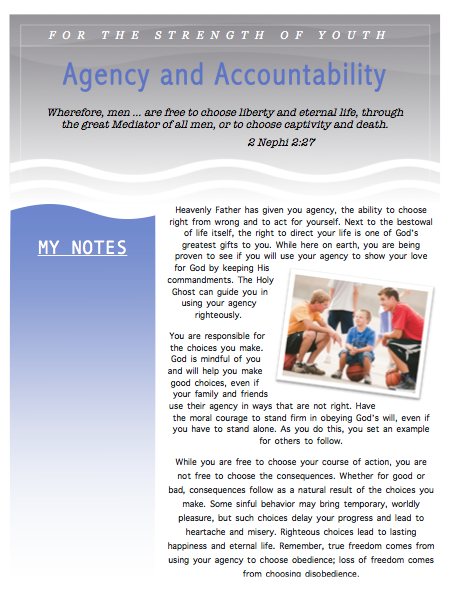 For the handout this week, I used the Choice and Accountability page in the Personal Progress Book. I printed out little wallet size pictures on photo paper to make a simple bookmark for the girls. So funny!! Adam is teaching the 12-13 yos too!! And I'm teaching the YW! Thank you! I just used this in my YW lesson on faith today and it ended up being a very powerful and thought provoking illustration. I'm so glad, Lara! It always makes teaching so rewarding when that happens! So glad it helped your young women. Thank you so much for this idea!! I'm excited to use it this Sunday! Sorry for the inconvenience! I just updated the PFD link to a new one that should work now! I LOOOOVE this idea!! Such a good object lesson! Thank you for sharing! I'm so sorry, Bret! I just updated the PFD link to a new one that should work now! Thanks...so excited to use this object lesson!